Good, news for marketers. Facebook is having a slight makeover to its Pages that will help businesses to better connect with their customers. Facebook announced new offerings to ‘Call-to-Action’ button that will help pages drive business objectives. Earlier, Facebook has allowed businesses to use call-to-action buttons on their pages, but the options are limited. Facebook is improving call-to-action buttons on Pages to allow people to Shop Now, Get a Quote, Request Time and do more effortlessly on Pages. Users can use these three new CTA buttons to drive engagements and discussions via Messenger. With the new updates, admins can select from options of call-to-action buttons which can be added the left of the “Like” button at the top of their Page. Facebook has introduced new call-to-action button integrations with third parties to make it easier for users to do things like order things and book appointments. To take benefit of these new additions, you’ll have to update your call-to-action button and go through the process of adding a third-party service. Start Order: Lets your users place orders via delivery.com or Slice. 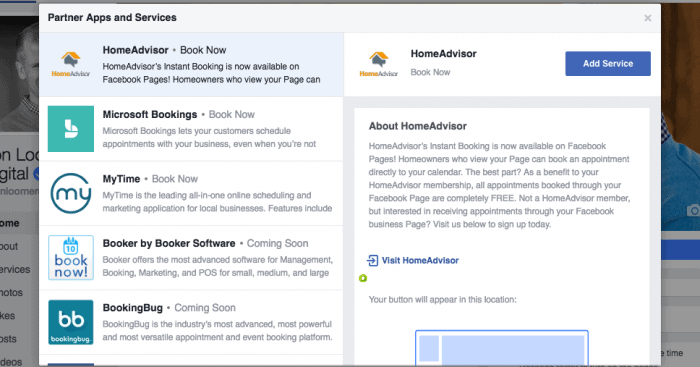 Book Now: Lets your users’ book appointments with your business via HomeAdvisor, MyTime, or other services. Buy Tickets: Lets your users buy tickets to your events via Eventbrite or Ticketmaster. See Showtimes: Lets users see show schedules and buy tickets via Fandango. Facebook also added a new ‘Recommendations feature’. This feature will help to get suggestions from friends or groups in any situation. Whenever you write a Facebook post, you will have the choice to turn on the Recommendations feature. Then, your friends can leave comments with recommendations. This includes an option to let them remark a relevant Facebook Page with their comment and also add their references to a map. Theses call-to-action button updates have started rolling out in the U.S. and will roll out worldwide next year.